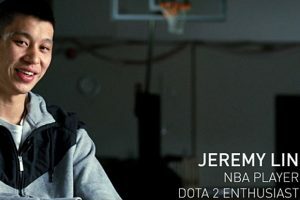 Brooklyn Nets Jeremy Lin has recently signed a deal with China Digital Group and Vici Gaming to help create the new Dota 2 team, VGJ, to develop a celebrity brand in eSports. The CDC has stated that eSports has become one of the most profitable businesses in growth over the recent years, and plants to build it an even bigger marketing plan. Lin’s world-wide fame in the professional sports industry will no doubt help them gain momentum on these new and upcoming products. The Torrance, California native started playing basketball towards the end of his high school years and took his team to the championships with a 32-1 record. He received offers to come play at Harvard University and Brown University and ended up going to Harvard between 2006 and 2010, and even though he entered the 2010 NBA Draft Lin went unselected. Instead, he got a chance to show his skills off at the NBA Summer League where he impressed enough scouts and got offers from a few teams but decided to sign with his home team, the Golden State Warriors. Over the course of his career, Lin also played for the Houston Rockets, New York Knicks, Los Angeles Lakers, Charlotte Hornets and he is currently with the Brooklyn Nets. The Nets player has joined forces with CDC and VGJ to help endorse and design the new Dota 2 team that will be the core Vici Gaming team. Stay tuned to see how Lin and the business put their heads together to create the best version of it yet. If your company is interested in finding out availability and booking fees for a NBA player like Jeremy Lin or other celebrities for a Product Promotion, Basketball Camp, Charity Event, or Personal Appearance, call us at 1-888-246-7141.